The state of Maryland, one of the oldest colonized areas in America, is a curious mix of opposites. While Maryland is the 9th smallest state it is also the 19th most populous. Southern Maryland shows another side of this mix since while Maryland itself is the state with the 7th highest population density, Southern Maryland still holds to its mostly rural and agrarian roots with a smaller population. Southern Maryland history is long and the area has scenic beauty and its access to surrounding jobs, historical sites and recreational activities make it one of the more interesting places to visit or live in the entire country. The area often referred to as the Western Shore (not to be confused with Western Maryland) was originally inhabited by the Piscataway Indians who made their living by hunting and farming corn, squash and beans. They also fished and harvested oysters in the rich waters of the Potomac River and Chesapeake Bay. As European settlers moved into the area, it would later be divided up into the counties of Charles, Calvert, and St. Mary’s. Historically the southern sections of Anne Arundel and Prince George counties are often seen as being part of the Western Shore. While many early immigrants to America were Protestant dissenters from England, Southern Maryland was the site of the first Roman Catholic colonization. Indeed the state name relates to Queen Henrietta Maria of France, wife to Charles I. These early immigrants made their living almost exclusively growing tobacco, corn and wheat. Later, iron production and shipping became the two main industries outside of agriculture. With its close proximity to Virginia, Southern Maryland played an important role during the Civil War. As much of Maryland’s economy, especially on the Southern Shore, was tied to agriculture, slavery was deeply entrenched. Outside of the cities of Baltimore or Annapolis, the state was decidedly pro-Confederate. However, the number of Union troops stationed in Maryland kept the state from seceding. Southern Shore ports where often used to smuggle contraband into Virginia for the Confederacy. Southern Maryland gained notoriety when John Wilkes Booth made his escape route through this area on his way to Virginia after he shot President Abraham Lincoln. While the bulk of the area remains tied to agriculture, many who live in the area today work for the government either in Washington D.C. or nearby Andrews Air Force Base or the Patuxent River Naval Air Station. However the area is still a popular tourist destination for crabbing and seafood enthusiasts. The once strong shipping and river freight industry died out in the 1930s when state highways and the interstates were built. Now the ports are primarily used for fishing and recreational boating. The most important area in the Western Shore was named for Charles Calvert, the third Lord of Baltimore and was made a royal colony in 1658. Today, Charles County is home to approximately 146,551 residents. The county is rich in Southern Maryland history with a variety of tourist attractions, natural beauty to enjoy and historic villages and historic homes to visit. The county seat of Charles County, La Plata, was founded in the 1870’s when the Pennsylvania Railroad was built through this area. La Plata suffered serious damage and setbacks in 2002 when a tornado ripped through the area. This tragic event had a positive side as the rebuilding effort has generated many new jobs as business moved to take advantage of the newer facilities going up. Other notable towns in Charles County include the town of Indian Head which is located on the banks of the Potomac River. Incorporated in 1920, it has been the site of various naval bases since 1890. The Naval Surface Warfare Center currently makes its home here. 7,442 residents make their homes in Indian Head, many of which work at the National Surface Warfare Center and the town has seen considerable growth over the past 10 years. 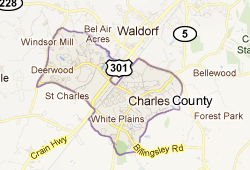 A majority of Charles County residents (over 67,000) make their homes in Waldorf. Settled in the late 1800’s, it was a prominent tobacco producer and popular gambling destination with Las Vegas-style nightlife before slot-machine and other forms of gambling were made illegal in 1968. While all of the Southern Shore is rich in Southern Maryland history, Charles County especially rich in offerings, with a variety of historical attractions and landmarks. Port Tobacco Village was once a bustling community but remains only as collection of historical buildings. The Port Tobacco Courthouse is a popular tourist destination and was in operation between 1876 and 1953. Christ Church Parish, formerly of Port Tobacco and now in La Plata, is considered the oldest continuously operating parish in the United States and is a historical landmark.